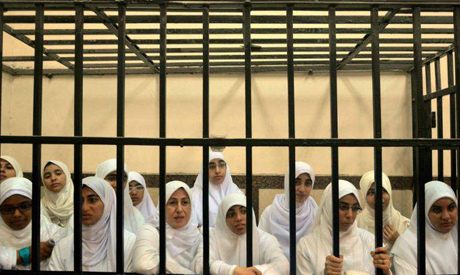 An Alexandria appeals court reduced the sentence of 14 female Islamist protesters previously slammed with over 11 years in jail to a suspended sentence of one year. Earlier in November, a criminal court sentenced the 14 female protesters to 11 years and one month in jail for destruction of private property, attacking security forces and stirring violence, and ordered that the seven female minors, also participating in these activities, be placed in a detention centre until they reach the age of majority. The appeals court has acquitted the seven minor girls, ages 15 to 17. The harsh jail sentences handed down to these female protesters, particularly the minors, sparked outrage in the country. In addition to the strongly worded statements released by human rights organizations and political groups, several protests were organized in solidarity with the young women. The 21 female protesters were arrested in late October during clashes with residents following a demonstration calling for the reinstatement of ousted Islamist president Mohamed Morsi. Authorities accused the demonstrators of inciting violence, blocking roads and damaging storefronts. No point arresting hoodlums if they walk out scot free Was the Judge a Morsi puppet apointee?? At least these mindless girls have a criminal record and the now know what to expect when they take orders from the MB. Medo: They were protesting repression, political tyranny, military rule, murder of innocent people, the usurpation of the will of the people, the overthrow of a legitimate democratic government at the hands of a military junta, the corruption of the justice system and rampant graft, nepotism, and other forms of corruption. It is Sisis, Adly Mansour and other criminals who ought to be behind bars or stand before a firing squad. Cute young girls with flowers - Is that why they were given a joke of a suspended sentence? I still remember how they giggled and joked the first time they were in court. They have no respect for the law and should have been sentenced in accordance with their crimes. Dear mado, what would happend if Morsy allowed the same Police to kill,arrest and torture the prosters who had been prosteing whole one year against Morsy ? Why you feel pain now when people using fundamental rights of free assembly,free spech...? You oppressive tactis cannot keep the voices quiet against the tyrants.